There seems to be no rhyme or reason when photos won't "publish" - can't click "done" if "done"does not appear! Sunday, the View Gallery opened a new show, following Margreth's.Larry Tillyer is the featured artist. This is called "Around the Corner" and is streets and houses around Vancouver. Done in Larry's colourful style, it is a joy to see. Barb Bowen, as usual, has done a great hanging job and the space shows off the paintings well. We are fortunate to have Fraserview doing this community outreach and giving artists a space to show their work. I know I certainly appreciated having paintings on show early this year. The picture shows Larry with Barb Bowen and a glimpse of Larry's impressionistic take on a house. I think I"d like to live there! Steveston Folk Music Guild put on a very enjoyable evening's entertainment on the 21st. Marvin forgot his picture (!) and Rita hadn't finished hers, but Bonita, Adrienne and I took our paintings of Elsa for display. Elsa was really pleased with them all.Each one was individual and captured different aspects of the model and the idea of performance. In the photo, Bonita's painting is just peeking over Elsa's shoulder. It shows the drama and ambiance of performance. Adrienne's is in her colourful style. In mine, I wanted to have a lot of warmth as well as the sparkle of the model. Elsa has a wonderful voice and can do those "trills" to perfection. (Do not expect knowledgeable music critique from me!) - Jose Gimenez is Guitar in the duo - Sangre Morena. Songs from many Latin countries were performed and Elsa often made variations on her costume to suit the country. There was a good crowd out- even on a rainy evening! A few weeks ago our drawing group was fortunate to have Elsa Rojas Marquez model for us. I did a pastel as well as several sketches. 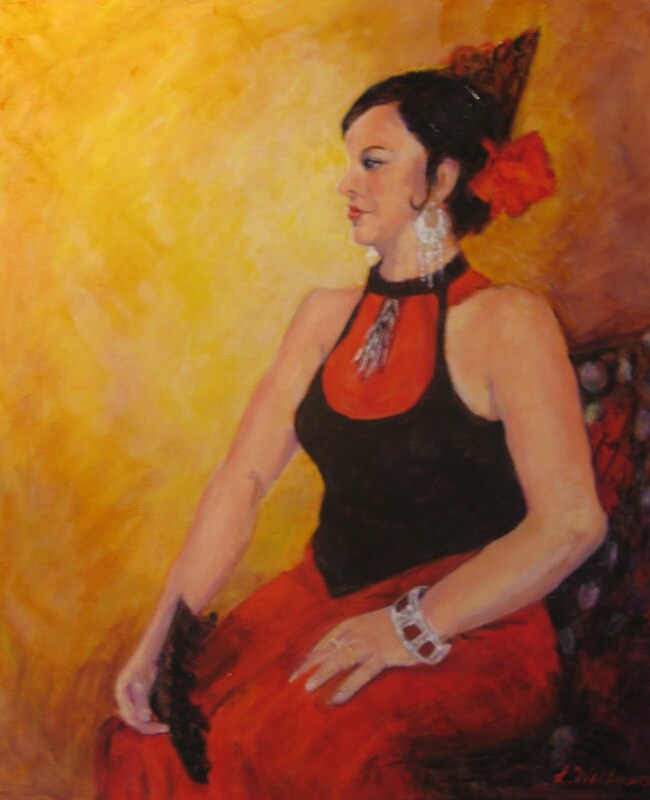 Elsa allowed us to take photos so I had a photo-reference as well as the pastel.Then, it turned out that Sangre Morena - of which Elsa is the "voice" was slated to perform at Britannia on October 21st and Rita McArthur arranged that we could show our artwork. I decided to work on a painting as it is more "complete" looking. The pastel would have to be matted and framed with glass to be shown properly. I also wanted the painting to have more warmth than the conte' drawing. So - here it is! I will take it to the performance on the 21st.